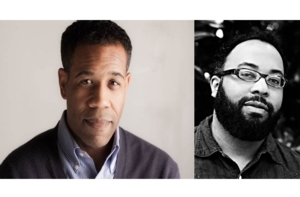 Tue, April 24, 2018 7:30 P.M.
“Intensely personal … funny and poignant” (New York Times), Gregory Pardlo’s poetry collection Digest won the 2015 Pulitzer Prize. An out-of-nowhere coup for the relatively unknown Columbia University MFA student and teacher, it was also nominated for an NAACP Image Award and was a finalist for the Hurston Wright Legacy Award, among other honors. In his new memoir, Pardlo tells the story of his strained New Jersey upbringing, fatherhood, addiction, and African American masculinity. The poetry editor for The New Yorker and the director of the Schomburg Center for Research in Black Culture at the New York Public Library, Kevin Young is the author of the poetry collections Blue Laws, Book of Hours, and Jelly Roll, a finalist for the National Book Award. His nonfiction books include Bunk and The Grey Album: On the Blackness of Blackness, a finalist for the National Book Critics Circle Award. From James Brown to John Brown’s raid to Brown v. the Topeka Board of Education, Young’s new poetry collection riffs on the themes of collective experience and color.